I've looked at this recipe from "Cuisinart’s The Connoisseur's Choice” in the June/July 1991 issue for a long time and never made it. However, I decided it looked so easy, and we were so unhappy with the chocolate cupcakes I made from a well-known mix last year, that I had to try it. Although the batter was thin, this recipe made a delicious, fudgy cupcake - perfect for a quick chocolate "fix." This uses a compact food processor. I would suggest a regular size food processor if your compact doesn't have a feed tube. Don't use the smaller bowl inside your larger processor; it's too shallow and makes a mess on the lid. If you use a large processor, reduce the 10 second last blend to 5 seconds, as it’s more powerful. This is so fast to make, you need to have your ingredients ready before you start. Don’t over-process; I use a stopwatch. I was amazed at how easily this method melted the chocolate. I used my microwave to heat the water and butter for a minute. I baked these in my good toaster oven to make them extra fast. I do hate recipes that divide the ingredients but don’t tell you in the ingredient list. This is one of those; the sugar is added in two ¼ cup amounts. 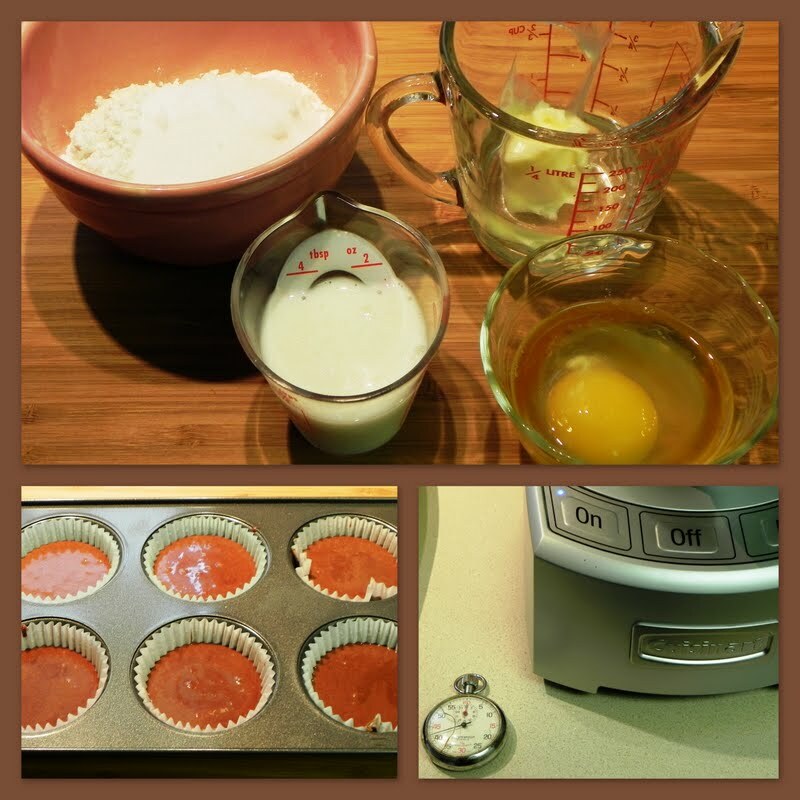 Line a 6 cup cupcake pan. Insert metal blade. Pulse-chop chocolate and 1/4 cup sugar 8 times; then process until finely chopped, about 45 seconds. Bring water and butter to a boil in a small saucepan or microwave. While machine is running, pour liquid through feed tube and process 15 seconds. Add remaining ingredients and process until blended, about 10 seconds (5 seconds in a regular processor). Use spatula to scrape work bowl. Divide batter among cups in muffin pan (about 1/4 cup each) and bake until toothpack inserted in cake comes out clean, 20-25 minutes. Cool in pan for 10 minutes. Transfer to wire rack to cool. Per Serving: 177 Calories; 7g Fat (36.3% calories from fat); 3g Protein; 26g Carbohydrate; 1g Dietary Fiber; 46mg Cholesterol; 159mg Sodium. Exchanges: 1/2 Grain(Starch); 0 Lean Meat; 0 Non-Fat Milk; 1 1/2 Fat; 1 Other Carbohydrates. Frost with any favorite chocolate frosting or dust with powdered sugar.